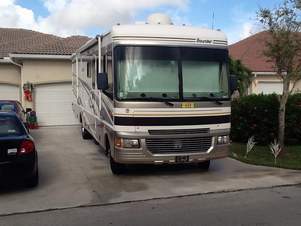 Original Owner fleetwood bounder located in Homestead Florida. 32' dual slides, 31800 miles. Great shape. Carpet,vinyl flooring.nice size shower and bathroom. king dome automatic satellite finder. Leather seats. Need to sell wife having medical problems. 50 Amp service. Blue ox tow bar included.My loss your gain.